The cult of David Hasselhoff is all very funny and kitsch - until somebody gets hurt. The first case of Hasselhoff-related serious injury comes, surprisingly, from the USA rather than Hoffmania's natural constituency of Germany. An employee of the Cumberland Farms chain in the northeast USA was seriously injured attempting to rescue Hasselhoff billboards stolen by a crazed fan. The employee, in Shelton, Connecticut, was injured while trying to prevent a thief driving off with two of the ads in an SUV. He was said to be in critical condition in Bridgeport hospital. Police are still searching for the SUV and two men and a woman reported to be in the vehicle. The company has been using the Hoff to advertise its iced coffee (a snip at just 99 cents), catchily named the "Iced Hoffee". The 61 year-old former Baywatch star plays up to his cheesy image, posing with a 99 cent gold medallion and clutching a coffee while grinning inanely in front of some rolling surf. The comic ads became a must-have item for the sort of people who Instagram every detail of their vacuous lives. Last summer the cut outs and pole signs were so popular that 550 of them were stolen by ironic hipsters from outside stores. Delighted at the publicity, the company ordered 1200 more for this summer, sparking another frenzy of theft. Cumberland Farms told TV stations that they did not condone the thefts: "The Hoff is there for all to enjoy." There is some dispute about the source of all the frenzy for the ads. 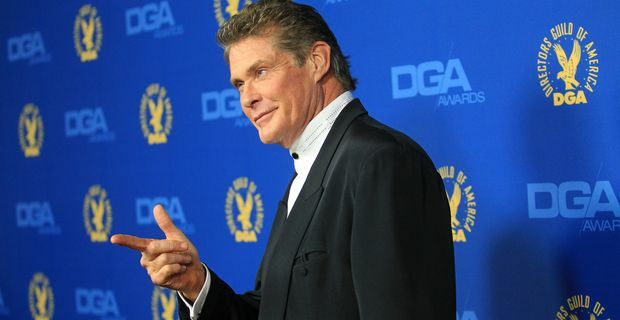 Some claim the fans are nostalgists who loved the Hoff from Baywatch back in the day. There is a persuasive counterclaim that Hoff is now a hero to a whole new generation of high school kids from his role in the Spongebob Squarepants movie.